At some point in August, Stockholm becomes a fearful place. 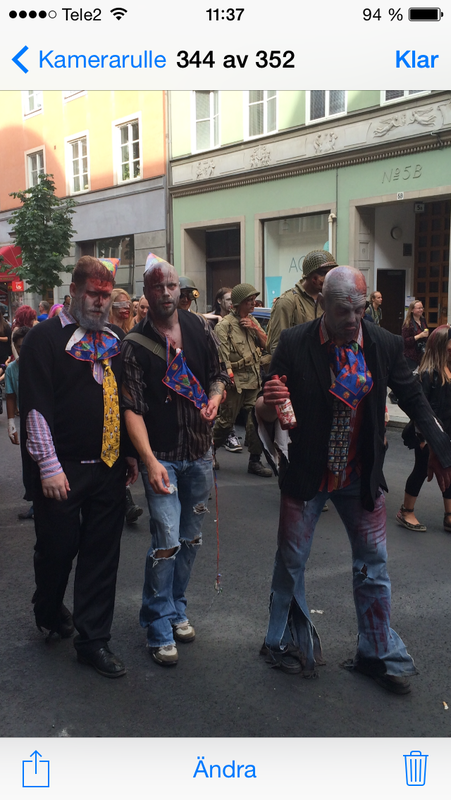 Hordes of zombies invade the city and bystanders should be careful not to get in the way. Starting in Östermalm, the zombies limp to a nearby underground station, where they travel the tube and arrive on Södermalm. Zombie nurses, zombie soldiers, zombie children, zombie clowns swarm out of the station and onto the street. Another sombre walk and they arrival at the zombie park to mingle and eat flesh. It’s a scary sight, not for the faint of heart. There are many festivals and parades in Stockholm, many of them taking place in the light summer months. Stockholm Pride on the first Saturday in August and the May Day parades on May 1st are probably the largest parades to watch. Another parade is ‘Stockholm Cruising’ also on the first Saturday in August where hundreds of vintage cars and rockabillies cruise along Sveavägen in Vasastan. ‘Shockholmen’ on the first Saturday in November in Kungsträdgården is Scandinavia’s largest Halloween parade. Like the zombie walk, it’s also a scary experience.